Lacewings are net-winged insects in the order Neuroptera. Lacewings are named for the adults’ intricately veined wings, which appear lace-like. There are two families of lacewings commonly found in Ohio: green lacewings (Family Chrysopidae) and brown lacewings (Family Hemerobiidae). Many species of lacewings are considered beneficial insects due to their voracious appetite for insect pests. Green lacewings have four intricately veined wings, thin bodies, and large round eyes. Green lacewing adults rely on pollen, nectar and honeydew as food sources. Photo credit: MaLisa Spring. Brown lacewings are often brown to gray in color with hairy bodies, and are often confused with moths. Brown lacewings, however, may provide valuable pest management services as larvae and adults. Photo credit: Eric C. Matthews. Debris-carrying larvae may use plant material, prey remnants or waxy secretions to aid in camouflage as protection from predators. Adult lacewings are soft-bodied, with long, slender abdomens and four membranous wings that have longitudinal veins and many cross-veins. They hold their wings tent-like over their abdomen at rest. Adults have chewing mouthparts, long thread-like antennae, and bead-like iridescent eyes. 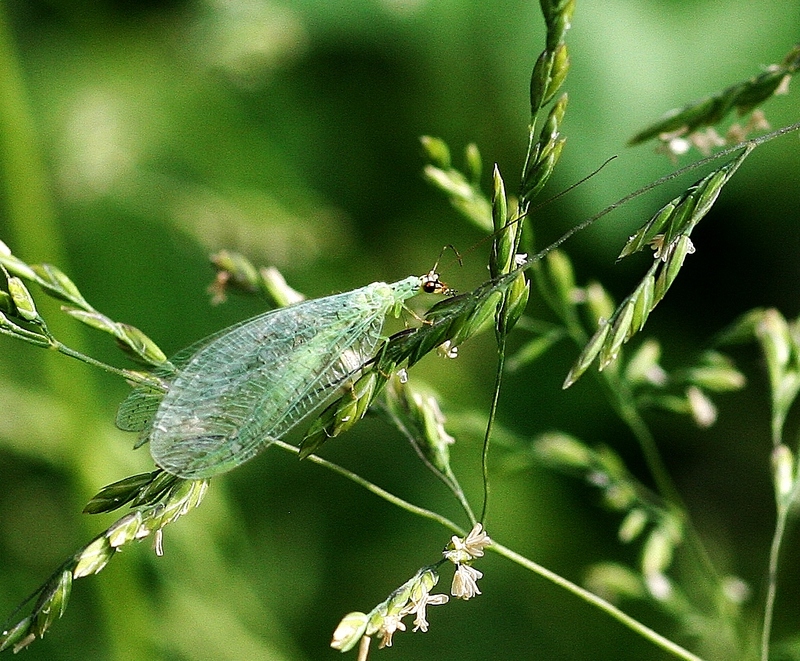 Green and brown lacewing adults are similar in appearance, with the most noticeable differences being color and size. Green lacewings usually have bright green bodies and lace-like green wings with thin veins and clear membranes. Brown lacewings are grayish brown in both body and wing. Due to coloring, brown lacewings are often mistaken for moths. In general, green lacewings range from 8 to 25 mm in body length whereas brown lacewings are generally much smaller, 2 to 13 mm. The body and wings of green lacewing adults are not hairy, while the body and wings of brown lacewing adults are hairy. Lacewing larvae are alligator-like in appearance, with tufts of hairs on their backs and large curved mandibles (jaws). They are usually a mottled brown and cream color. Larvae of green lacewings have a body that is wider in the middle than at the ends, and have mandibles that are long and sickle-shaped. Larvae of brown lacewings have a body that is more uniformly narrow, and mandibles that are shorter and not as curved. Larvae of different species of lacewing resemble each other closely, with some variation in color. Depending on species, green lacewing larvae may be “naked” or “debris-carrying.” Debris-carrying larvae cover themselves with material such as plant matter to provide camouflage from predators. Brown lacewing larvae are not known to carry debris. Lacewings undergo complete metamorphosis with egg, larval, pupal and adult stages. Some species of lacewings use sound waves as mating calls. Mates detect vibrations with ultrasonic receptors located at the base of their intricately veined wings, which can also be used to detect predators. After mating, females deposit eggs singly or in groups, depending on the species. 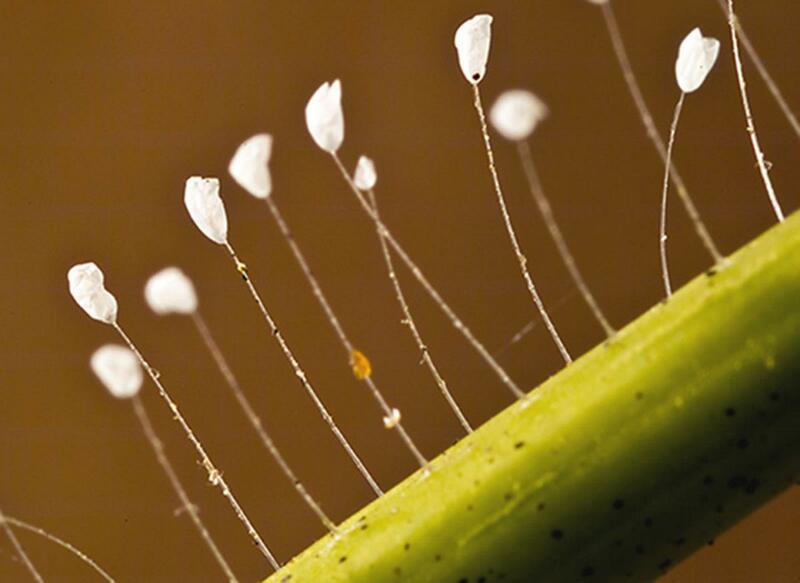 Green lacewing species deposit eggs onto the ends of thin stalks attached to vegetation, so that eggs are separated from each other, reducing likelihood of cannibalism as hungry larvae emerge. The protruding stalks also provide some protection from predators. 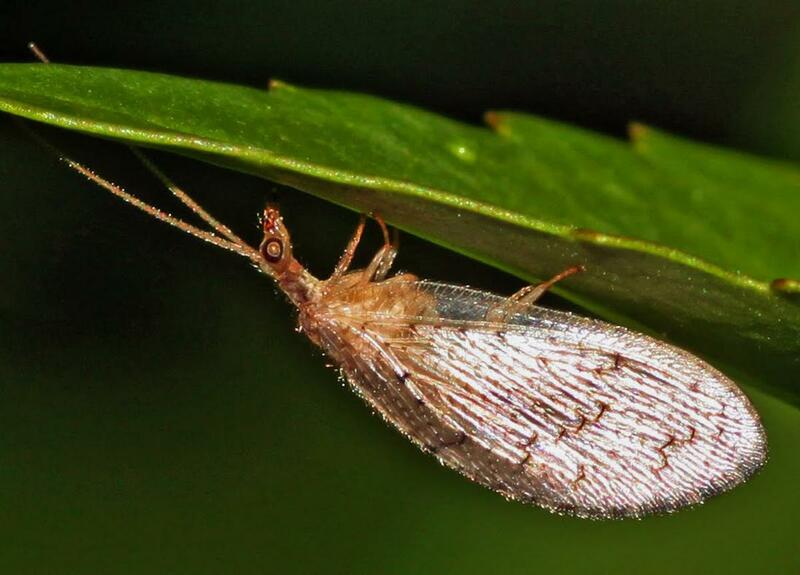 Brown lacewing species deposit eggs directly onto vegetation, without stalks. 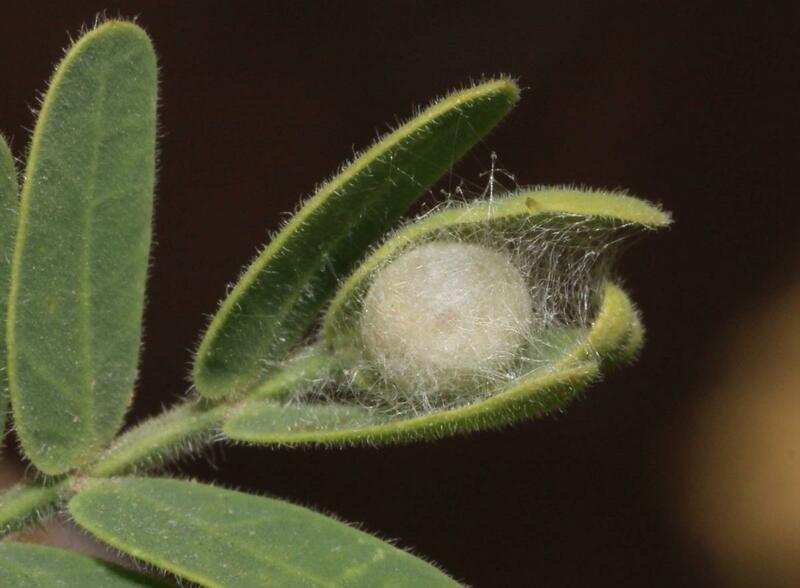 Eggs are deposited on vegetation in areas where prey will likely be abundant as larvae emerge. 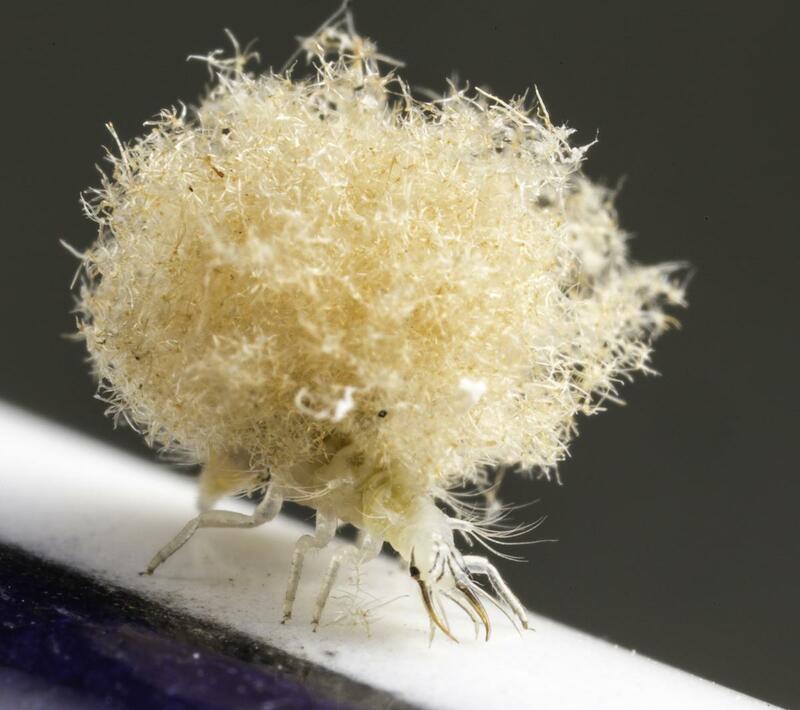 Lacewing larvae develop through three instars, then pupate in silky, round cocoons resembling tiny cotton balls, protected by vegetation. Green lacewings protect eggs by depositing them on long, thin, stalks, out of reach from predators. Photo credit: Gary R. McClellan. A lacewing pupa, protected by vegetation. Photo credit: Lon Brehmer and Enriqueta Flores-Guevar. 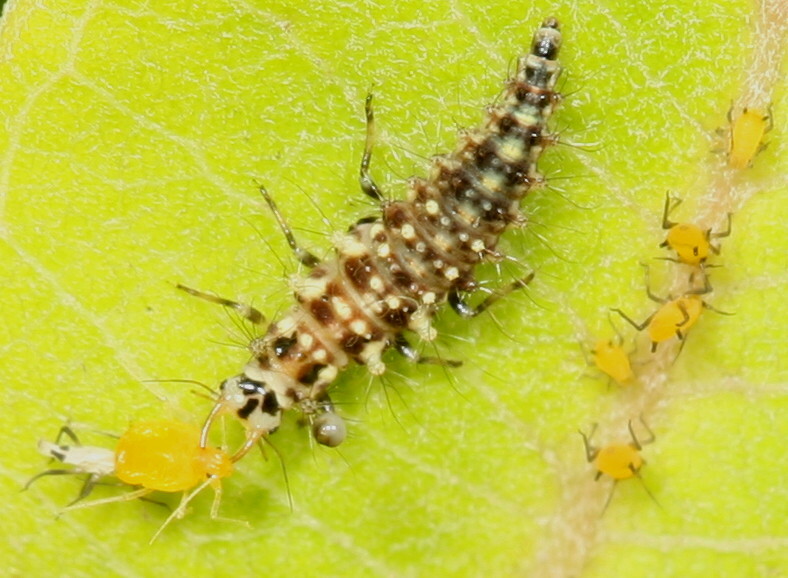 All lacewing larvae are predators and are important contributors to biological control. Lacewing larvae may consume up to 200 soft-bodied insects per day, utilizing their large mandibles to pierce prey and consume the liquid contents. Green lacewing larvae have a reputation as voracious aphid predators, and are often referred to as “aphid lions.” While lacewing larvae do feed on aphids, they are generalist predators and also feed on a wide range of soft-bodied insect pests including mites, whiteflies, mealybugs, and insect eggs. All brown lacewing species are predatory in the adult stages as well, while only some green lacewing species are predatory as adults. Other green lacewing adults feed on pollen, nectar or honeydew—the sweet, carbohydrate-rich excrement of sap-feeding aphids. Natural populations can be encouraged by establishing flowering plants to provide adults with pollen and nectar resources. In addition, lacewing eggs, larvae and adults are available commercially for purchase. Lacewings can be released in gardens, in greenhouses, or on farms. 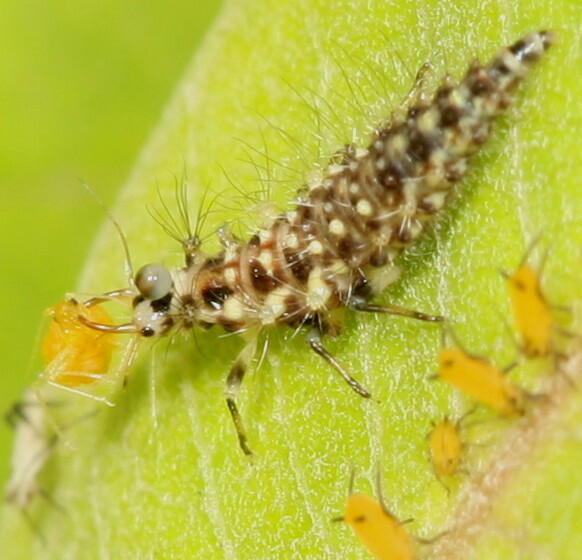 Lacewings are predatory in the larval stages, when they cannot fly away, thus releasing the larval stage will provide the most immediate pest control. As with all natural enemies, lacewings are most effective at preventing pest problems from developing, rather than eliminating overgrown pest populations. For effective control of large pest populations, lacewings should be used as one component of an integrated pest management program. Lacewing larvae use their large mandibles to pierce prey. They lift the victim so that its liquid contents flows down their mandibles and is ingested.